Is Hollywood's 'Alien Fever' Inspired by Real Science Finds? 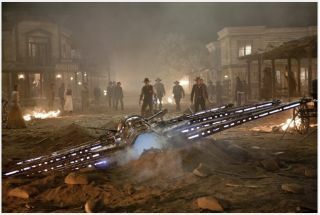 Still of Harrison Ford and Daniel Craig in Cowboys & Aliens. Hollywood seems to have caught alien fever. In the past few months, a slew of big-budget alien movies has hit theaters, from kiddie flicks ("Mars Needs Moms") to comedies ("Paul") to high-octane action films ("Battle: Los Angeles," "Green Lantern" and the just-released "Cowboys & Aliens," among others). And many more such movies are on the way, both this year and next. This glut of alien sci-fi films comes at a time when scientific discoveries are making the existence of life beyond Earth seem more and more plausible. And that might not be a coincidence, some experts say. Just 20 years ago, scientists had yet to find a single planet beyond our own solar system. Now the count of confirmed extrasolar planets tops 550, with many more about to be added to the list. In February, for example, scientists announced that NASA's Kepler space telescope had detected 1,235 candidate alien worlds in its first four months of operation. Of those, 54 likely orbit in their host stars' habitable zone — the range of distances that could support liquid water. These candidate planets need to be confirmed by follow-up observations, but NASA researchers have estimated that at least 80 percent will end up being the real deal. And last year, astronomers reported strong evidence that the Saturn moon Enceladus likely harbors a huge and salty ocean beneath its icy crust. Subsurface oceans are also suspected to occur on other moons, such as Saturn's Titan and Europa, a satellite of Jupiter. In short, the prospect that life exists beyond Earth — and perhaps even beyond our solar system — is becoming more and more likely. This is big news that affects the way many people view our species and its place in the universe. And now more than ever, Hollywood may be tapping into that growing well of interest. "My suspicion is, even if Hollywood weren't pushing it, people would be interested," Perkowitz told SPACE.com. "I think the straight science turns them on, but there's no doubt that Hollywood knows how to enhance it, and how to use it in really effective ways." Of course, it's not as if Hollywood has just discovered that aliens can be box-office gold. Alien films have been around — and have been raking in big bucks — for decades. So Shostak — who has advised Hollywood on a number of feature films, including 1997's "Contact" — thinks this year's surge may just be part of Hollywood's regular cycle, which tends to feature waves of alien movies from time to time. He does, however, sense an overall increase in alien movies in the last two decades. But this trend may have more to do with geopolitical developments than scientific ones, he said. "I think that they became popular after the collapse, in 1991, of the Soviet Union," Shostak told SPACE.com. "You still needed bad guys in movies, and all of a sudden your favorite bad guys — who came from behind the Iron Curtain — they weren't available anymore." "There's no anti-defamation league, if you will, for the aliens," Shostak said. "And they have another advantage: They don't ask for residuals. They're cheap. You have to computer-animate them, that's true, but that's a lot cheaper than hiring a big-time Hollywood star." Indeed, computer-generated imagery (CGI) has matured significantly over the past few decades, roughly paralleling the rise in alien films that Shostak sees. Perkowitz thinks that's no coincidence. "They can make really spectacular and persuasive aliens now, which they couldn't do 30 years ago," Perkowitz said. "Thirty years ago, you had a guy jumping around in an alien suit. Now it's much more realistic." Both Perkowitz and Shostak said they're usually happy to see aliens rendered on celluloid, however clumsily or sensationally. "In general, I think almost anything Hollywood does with science and technology, even if it's not quite right, is a good thing, because it's some level of exposure," Perkowitz said. Shostak stressed the emotional hold that movies can have on kids. Compelling sci-fi films can plant a seed of curiosity in youngsters, spurring them to investigate scientific issues on their own — and perhaps even become scientists down the road. "These films can have a big impact," Shostak said. That impact can extend into the social and cultural arenas, Perkowitz said. Films about aliens can alert moviegoers to issues that would be difficult or controversial to treat in a straightforward fashion. He pointed to "District 9," a 2009 South African film that many viewers — including Perkowitz — read as a comment on the evils of apartheid. "You can talk about really serious social issues in a metaphorical way by using aliens instead of people of a different color, a different culture, a different race or whatever," Perkowitz said. "We can use aliens as stand-ins for what humans do to each other."